The hippo is the second largest mammal on land after the elephant. The body is large and stupid, with a body length of 350-450 cm, a tail length of about 56 cm, and a body weight of 3000-3500 kg, but it is short, the limbs are extremely short, and the shoulder height is high. Only 140-165 cm, not as high as half of the image. There are a thick head and a particularly large mouth that is larger than the mouth of any animal on land and can be opened at a 90-degree angle. The teeth in the mouth are also very large. The incisors and canines are fangs. They are the main weapon of the attack. The lower incisors do not grow upwards but extend parallel to the front like a shovel. The length can reach 60-70 cm and the weight is 2-3 kg, the length of the canine is also about 75 cm. Eyes, nostrils, ear shells, etc. are born on the upper end of the face, almost in the same plane. The skin is very thick, with a thickness of 4-5 cm on the back and sides. It is dark brown and reddish purple, smooth and hairless, with some hair only on the mouth, inside the ear and on the tail. There are four toes of almost equal size on the front and rear limbs, and the toes have hooves, which are shaped like flat claws and slightly twisted between the toes. The hippo’s body is covered by a thick layer of leather. The skin is blue-black with brick-red markings on it. Except for some short hair on the tail, there is almost no hair on the body. The hippo’s skin is thick and the inside of the skin is a layer of fat, which makes it easy to float from the water. When the hippo is exposed to the air, the amount of water on the skin is much more evaporated than in other mammals. There are no sweat glands on the skin of the hippo, but there are other glands that secrete a reddish moist substance similar to sunscreen lotion. And can prevent insect bites. Hippos can’t stay outside the water for too long. For this reason, hippos must be kept in water or in damp habitats to prevent dehydration. Generally living in rivers, lakes, swamps, lush vegetation and reeds, some habitats can reach an altitude of 2,400 meters. Hippos live in groups, swim well, be cold, and enjoy a warm climate. Their skin will dry out from the water for a long time, and the foraging, mating, littering and breastfeeding in life are also carried out in the water. The hippo is a herbivore, but the sparse fangs are ten centimeters long, and the female hippo is extremely aggressive in protecting the small hippo. Hippos are paired or grouped into small groups, and older males often work alone. Nocturnal: They sleep or rest in the river or near the river almost all day, and come out to eat at night, sometimes swimming more than 30 kilometers for food. It mainly feeds on aquatic plants; it eats land crops, mainly grass, and sometimes goes to the fields to eat crops. When food is short, they also eat meat. The hippo’s body is huge, but walking in the water is very light. In the hot sun, the surface is covered with muddy water to protect it from the sun. The sweat glands of the hippo’s skin can secrete a red liquid as a natural sunscreen to moisturize the skin, often mistaken for blood, called “sweat.” Because its skin is very sensitive, it will chap when it leaves the water for a long time, so it stays in the water for most of the day, relying on the help of water to regulate body temperature and prevent the skin from cracking. Sleeping at night is on the shore. Its vision is very poor, and it can’t be seen even above the water, but it does not affect its life, because the underwater is often very turbid, and it is impossible to see the distance. Hippo likes to live in camps, and is led by females, each group of 20-30, sometimes as many as one hundred or more, especially in densely populated areas, with an average of one per 5.5 square meters. It has a special set of muscle tissue that is flexible like a valve. It can close the ears and nostrils during diving. Each dive can take about 5-10 minutes, but it is not physiologically similar to aquatic mammals. Water adaptability, life on land is also very long, can run at a speed of 20 kilometers per hour, so it can only be regarded as a semi-aquatic animal. 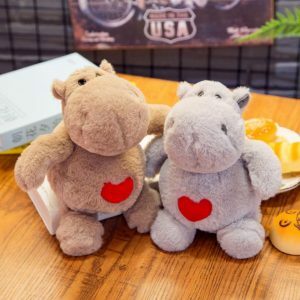 Usually, the hippo will be completely immersed in the water, only the ears, eyes and nostrils will be exposed to the water surface, so that not only can the normal breathing, but also the danger can be detected in time without being detected by the enemy. In addition to being safe and cool, water can also help support its large, heavy body, allowing it to walk freely in the water. 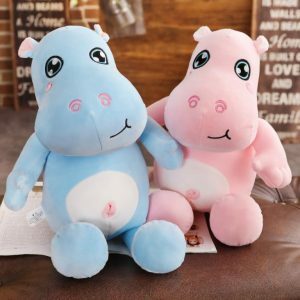 Although the hippo always stays in the water, it can’t swim and can only dive. In the case of fright, it is generally avoided in the water. Most of the time in the water, when the water is lurking, the head is usually exposed to the water every 3 or 5 minutes, but it can be lurked for about half an hour without breathing out of the water. Hippos are usually quieter. Once they start tempering, they often fight. They use their sharp teeth to stab the thick skin of each other. Sometimes he started to anger in the river. He dared to turn over the boat and bite the boat into two sections. 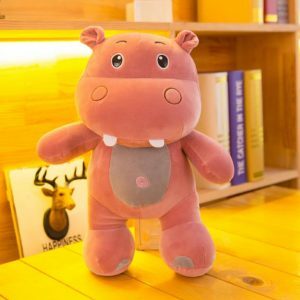 Kaida toys manufacturer can custom hippopotamus stuffed animal for you. Welcome to contact with us.